Leave it to my mother to be creative; that's really her forte. She's been using the etrog in her Thanksgiving cranberry sauce for years now, and a few years back she started making marmalade. Now she doesn't go to all the trouble of soaking jars in a hot water bath, sealing them professionally and destroying any possibilities that bacteria will sneak in and give all of us botulism -- but hey, these marmalades aren't around for long enough that we really have to worry about it. Her no-nonsense packaging solution is mini tupperware containers. They stay just fine in the fridge until Passover, and by then my dad makes sure to finish them off. While it may sound like a complicated project, it's really not: the ratio of sugar:liquid:fruit is one:one:one, and once it's on the stove top you just stir until it drips off the spoon in a particular way. The catch is that it's incredibly time-consuming. Pick up a paper, 'cause between the measuring, the waiting, the stirring, the checking, the packaging and (finally) the tasting, this is an all-day affair. Actually, make that an all-day-and-the-night-before affair, since if you don't like your marmalade to taste horridly bitter, you have to soak the peels overnight. But it sure it worth the trouble. Ratio of fruit:sugar:water/juice is one:one:one. fruit: we use etrog, apricot, orange, kiwi, pomegranate, cranberry...you name it. **My mom substituted some lime syrup she had lying around for a bit of water in one batch, and some juice she had for some water in another. If you sub juice or fruit syrup or other sweet liquid for any of the water, cut the sugar accordingly. By "accordingly" I mean if you use, say, 1/2 a cup of juice, cut the sugar by about 1/8-1/4 of a cup, say. Begin the night before you plan to make the marmalade. Wash and scrub the peels of any citrus fruits you plan to use. Then peel the fruit, pick out any pith (that's the white stuff between peel and fruit) (optional), and grind peels in the food processor until they're in small bits. I warn you -- this stuff is fragrant! Soak the peels in water overnight. You'll drain them the next morning. This should help remove some of the bitterness that the peels would have imparted to your marmalade. The next morning, drain the peels. 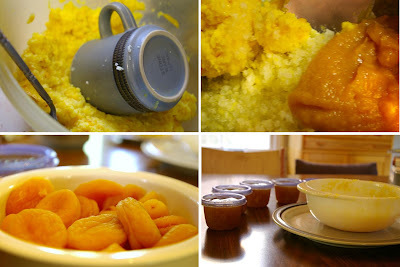 If you plan on using apricots or any other dried fruit, you have to reconstitute them before using them. Reconstituting dried fruit involves letting them soak in boiling water until they puff up a bit and get juicy. I enjoy some reconstituted dried fruit more than their fresh versions, and apricots are no exception: they're juicy like fresh apricots, but softer, and their flavor is greatly intensified. If you do reconstitute any dried fruit (and I recommend apricots), save the liquid and use it instead of some of the water in your recipe. Here's a cheat sheet of how we used each fruit in our marmalade. This can serve as inspiration for you when you make yours, but it is in now way exhaustive. Cranberries: these cook very quickly and have a lot of natural pectin in them, so they firm up easily. Add them to your marmalade about 5-7 minutes before it's finished. Now you're ready to make marmalade. Into a heavy saucepan, put equal parts of fruit, sugar, and liquid. Turn the heat on high until it reaches a boil, then lower the heat to low-med and let the mixture simmer. This will take between 15-20 minutes. The idea is to check for doneness with a wooden spoon. Every so often, stick your spoon deep into the marmalade, remove, and hold it horizontally over the pot, letting everything drip off of it. At first, the marmalade will be liquidy and will dip easily, in a steady stream. As marmalade reduces, it will start to coat the spoon and drip a bit more slowly. When marmalade is nearing doneness, it will form two points on the spoon from which it drips. When it's done, the two points will merge into one, and it will sort of dribble off the spoon in one slow motion. Basically, you'll stop cooking it when it's thick to your liking. There's no real rule about this -- it's a matter of taste. As for cranberries, I mentioned about that they should go in about 5 minutes before your citrus fruit are finished, if you choose to use them. They'll gel much more quickly than the rest. You can eat your marmalade on toast, as a sauce on chicken or meat, as a condiment on most anything, or out of the tupperware with a spoon. And can I tell you? It's pretty darn great.